View all products by GoBIO! 100% Organic candy with organic dairy, fruit concentrates, and spices, including turmeric and spirulina. Sweetened with Beet Sugar. 100% Organic including Organic Gelatin. No Artificial Flavours, Preservatives, or Sweeteners. Ingredients: Organic glucose syrup, organic beet sugar, organic gelatin, organic skim milk powder, organic yogurt powder (milk) - organic low fat (1% is equivalent to 11% yogurt) - low fat, citric acid, natural flavouring (lemon, raspberry, strawberry, black currant, apple, orange), organic elderberry juice concentrate, organic turmeric extract, organic spirulina extract, organic caranuba wax. Oh my goodness, these are delicious! I think I maybe ordering a few more packages of these! I love these and have others hooked on them!. These taste very good, but are quite gummy. 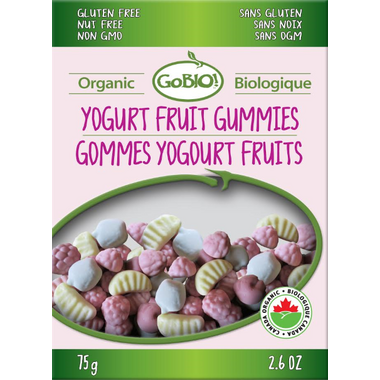 Great flavours, texture, and ingredients -- possibly the cleanest gummies I've ever seen. Kids and adults will both love them.